This article was first published on 08 Nov 2018. Some plants people either love or hate; Podophyllum ‘Spotty Dotty’ is one of those plants. Some people think it looks ghastly while others go dotty over it. A herbaceous perennial, it slowly spreads by rhizome over time. New growth appears in spring, the emerging leaves looking a little like closed umbrellas that open as the stems rise. They are also heavily textured, the base colour is green with mottled brown and red spots. Over summer the colours fade out or turn a deep green. Clusters of red, gracefully hanging flowers are produced in spring. Unfortunately this hybrid has sterile flowers and will not produce large fruits as do some of the Podophyllum species. Mature plants will reach a height of about 40cm to 50cm and a similar width. 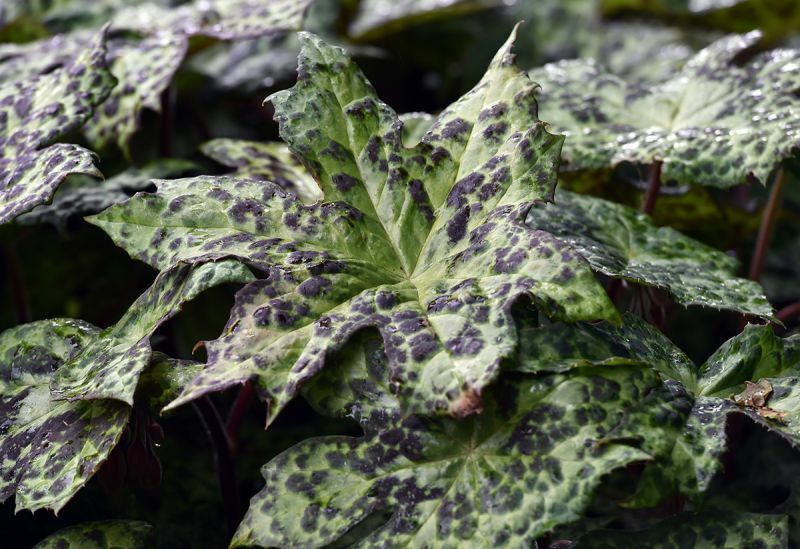 With such dramatic foliage Podophyllum 'Spotty Dotty' should be positioned somewhere it will attract lots of attention. Close to a path or the front of a border is ideal and it can be grouped with a lot of different plants. Such bold foliage goes well with soft greens such as Japanese maples but looks good against dark foliage as well. It will grow in many locations although it prefers a shaded, cool, woodland setting where the colour in the leaves will last the longest before fading out. Moist, free draining soils are best as it may suffer from root rot if soils are too wet. At Dunedin Botanic Garden a large group is planted amongst Japanese maples in the Clive Lister Garden.